A flooding river is very hard to stop. Many residents of the United States have discovered this the hard way. Right now, over five million Americans hold flood insurance policies from the National Flood Insurance Program, which estimates that flooding causes at least six billion dollars in damages every year. Like rivers after a rainstorm, the financial costs are rising along with the toll on residents. And the worst is probably yet to come. Most scientists believe that global climate change will result in increases in flooding. The authors of this book present a straightforward argument: the time to stop a flooding rivers is before is before it floods. Floodplain Management outlines a new paradigm for flood management, one that emphasizes cost-effective, long-term success by integrating physical, chemical, and biological systems with our societal capabilities. It describes our present flood management practices, which are often based on dam or levee projects that do not incorporate the latest understandings about river processes. And it suggests that a better solution is to work with the natural tendencies of the river: retreat from the floodplain by preventing future development (and sometimes even removing existing structures); accommodate the effects of floodwaters with building practices; and protect assets with nonstructural measures if possible, and with large structural projects only if absolutely necessary. "The authors help the reader to rethink flood 'problems' and 'opportunities' by posing questions that need to be answered for informed floodplain management decision-making in any context. With its analytic approach and numerous examples, this book will serve admirably as a text for anyone whose work involves floodplains." Jon Kusler, educator, attorney, author of "Our National Wetlands Heritage"
"A good read for the student or local official wanting to understand the range of topics making up the world of floodplain management— made interesting and real through case studies." 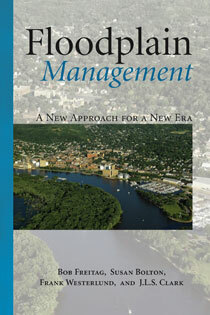 "This book provides steps and processes for how we can use natural river ecosystems to reduce flood risk naturally. It also discusses ways to protect these rapidly depleting natural resources, showing how we can develop wisely, with the future in mind." "This book is a brilliant, practical approach to solving the problems we cause to people, the environment and the taxpayer as we develop and re-develop in hazardous areas throughout our nation's floodplains." Edward A. Thomas, attorney, Michael Baker Jr., Inc.